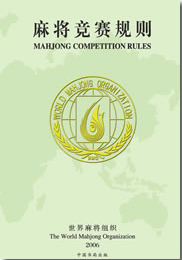 Chinese Official Rules (CO) is also known as International Rules, Mahjong Competition Rules (MCR), the New Mahjong. The rulebook contains 81 combinations, based on patterns and scoring elements popular in both classic and modern regional Chinese variants. Some table practices of Japan have also been adopted. Chinese Official mahjong was developed in 1998 by the China State Sports Commission, in the interest of changing mahjong from an illegal gambling game to an approved ‘healthy sport’. The principles of the new, healthy mahjong are: no gambling, no drinking, no smoking. In international tournaments, players are often grouped in teams to emphasize that mahjong from now on is considered a sport. Although the Championship 2002 it was generally accepted to be the first World Mahjong Championship, the 2007 event in Chengdu, Sichuan, China was titles the First World Mahjong Championship. The next championship in 2010 in Holland was named the 2nd world championship. A run or sequence of three tiles. Normally seating is arranged by the tournament committee prior to play. For casual play any seating arrangement will do. Tiles are then dealt accordingly to each player. The wall will be 18 tiles in length. There is no dead wall. All tiles in the wall are used. Replacement tiles are drawn from the very end of the wall.